In May 2014, Meridian Construction was contracted by Biwater to assist with the installation of an 18”, high-density, polyethylene (HDPE) main sewage pipe that leads from the Road Town Pump Station to the tertiary sewage treatment plant at Burt Point, Tortola, BVI. Due to the fragile geology of the area through which the pipes were to be run, Meridian worked with Puerto Rico Drilling to install the pipes using the innovative Horizontal Directional Drilling (HDD) method. This method would minimize disruption to the existing surface and subterranean infrastructure including existing utilities. 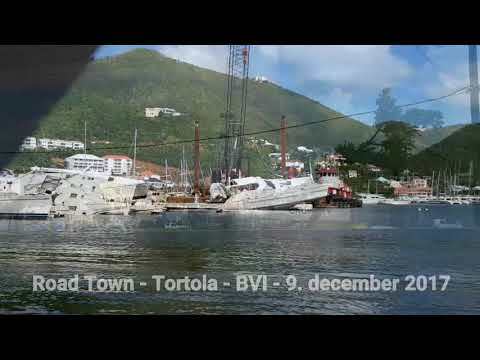 This was the first time that HDD was to be implemented in the BVI. Careful planning was required to survey the proposed drilling area to ensure that traffic was not affected at any time and to locate utilities to avoid any impact or damage. The 18” pipes came in 40’ lengths pre-welded in 120’ sections. They were installed at a depth of 7’ and run underneath all existing infrastructure and utilities. The HDD method requires specialized equipment to drill entry and exit pits for the drill rod and to install the pipes. The pits also served as a containment area for any slurry mix which had to be vacuumed out to keep areas clear and free of soil and slurry. The mix of soil and slurry was injected by the drill rig and remained in a gelatinous state until the pipe was pulled in. The slurry mix then hardened around the utility pipe to create a hard, natural grout which not only provided a protective encasement but also prevented ground settlement as it filled the space between the utility and the ground. A smaller HDD pilot bore was directed from the point of entry to exit using a drill locator system. This provided the drill operator with information on the depth, orientation, temperature, and inclination so that the drill could be steered accurately to the exit pit. Once the bore length was drilled, it had to be enlarged to a 30” diameter bore, 1.5 times the size of the 18” pipe, so that the utility could be installed without restrictions or damage and to allow for the slurry mix to flow and settle. Since the method of enlarging and pulling through the pipe could not be interrupted, Meridian ensured that this portion of the work was undertaken late at night when there was minimal road traffic. Additionally, the pipes were installed in 120’ segments which were then thermally fused together at entry/exit pits. The pits were then refilled and resurfaced to minimize disruption to the flow of traffic during the day. The project required a total of 12 bores and 13 entry/exit pits. Since HDD is not suitable for rubble filled or rocky terrain, a length of 550’ of pipe had to be installed along Waterfront Drive through open trenching.